The North Carolina Coastal Federation hosted 100 volunteers at Carolina Beach State Park on Friday, March 15, 2019. The volunteers were comprised of a group of 40 Marines, a group from SML, a global business and branding solutions providers, and members of the community. 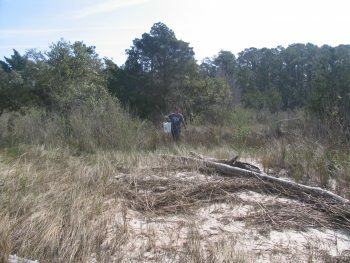 The groups spent several hours at Carolina Beach State Park assisting the federation in a shoreline cleanup. “The effort to do a beach cleanup was rewarding to say the least,” said Tim Holder, a volunteer at the event. Because there were so many dedicated volunteers, everyone was able to split up and cover miles of shoreline that otherwise may have been missed in a smaller group. Much of the debris collected were leftover from Hurricane Florence as the city has still not completely recovered from the effects of the storm. Lumber from destroyed docks and piers was one of the more common items found during the cleanup as well as several tires and household items. 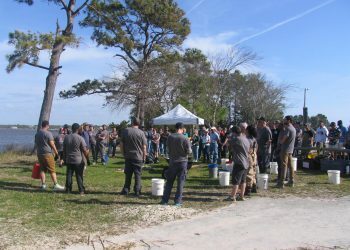 “This area took a huge hit from the hurricane and still has a long road to recovery, but stopping the chemicals from pressure treated wood from leaching out and continuing to pollute our waters will make a significant improvement to the water quality here,” said Bonnie Mitchell, federation coastal outreach specialist.